The moose is a grand and dignified animal and relays the seemingly forgotten message that nature commands attention, awe, and respect. The Moose (Alces alces) is a species of deer located in the Northern Hemisphere, specifically in Alaska, Canada, and Europe. This large and gentle creature ventures through the boreal forest region without much to worry about. American Expedition is proud to present Moose Information, Interesting Moose Facts & Trivia, and photos of Wild North American Moose. Moose are the largest living member of the deer family. While mostly found in northern United States and Canada, they are also found in Europe. However, in Europe the animal is known as a Eurasian elk. Standing up to seven feet at the shoulders and weighing up to 1800 pounds, they have very few natural predators. Moose are able to run at speeds of up to 35 miles per hour and are capable of swimming up to 10 miles without stopping. Moose range in color from light brown to a very dark brown color. Male moose, known as “bulls,” tend to be darker than female moose, or “cows.” The color variation is especially noticeable in the facial region. Moose have a long flap of skin beneath their throat called a bell. The definite reason for this feature is unknown, but it is thought that it most likely is used to attract a mate. The bell is more prominent in bulls than cows. Moose are very famous for their large antlers. A mature bull may grow antlers that span 6 feet and weigh up to 70 pounds. The bull's antlers take only about 5 months to fully develop, which makes them one of the fastest growing animal organs. 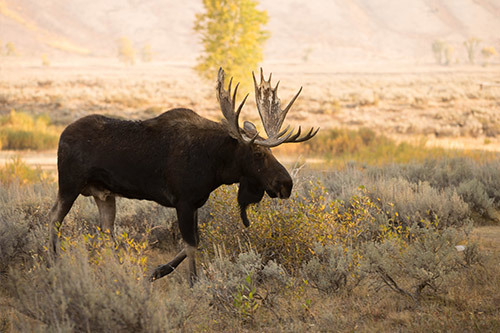 In early December, bull moose will shed their antlers, and will immediately start growing new ones. Moose are solitary animals, but during mating season moose will herd into groups for the purposes of finding mates. Cows will attract bulls with loud moans, while bulls will compete with each other by antler fighting. 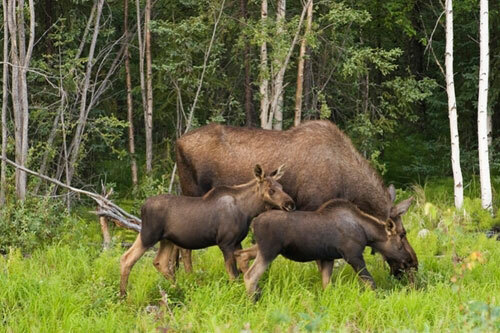 Breeding season for moose extends from September through October, and in late May or early June cows give birth. Moose will usually give birth to one calf, but it is not uncommon that twins will be born if food is plentiful. The calf is reddish-brown in color and weighs around 25 pounds at birth. They are capable of gaining over two pounds a day while they are nursing. The calves are weaned at five months, but their mother will rear them for up to a year. During this period the cow will defend her calf from any potential threats. Oftentimes, a cow will have to drive off her offspring after a year in order to care for a newborn calf. A bull does not become sexually mature until the age of five, while the cow is ready to breed by the age of 1 ½ years. The average life span of a Moose is about 10 to 15 years. On average, moose live 10 to 15 years in the wild. Moose are considered fully mature at 4 to 5 years of age. Moose are remarkably agile for their size, capable of running at speeds of up to 35 miles per hour. Moose are capable of swimming up to 10 miles without stopping. Moose are unlike many other deer species in that they are mostly solitary animals. However, strong bonds exist between mothers and calves. The moose population in North America is estimated to be fewer than 1.5 million, with 1 million in Canada alone. Up to 200,000 are estimated to live in Alaska. Moose are herbivores, and eat a large amount of terrestrial vegetation, but they also must need to consume a good amount of aquatic plants which provide moose with sodium. 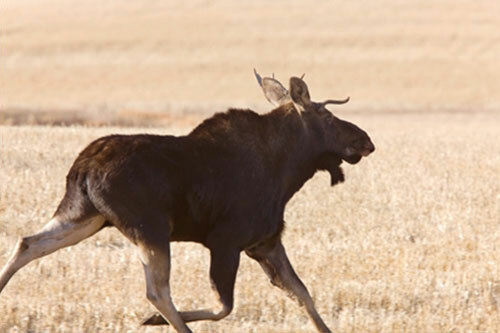 If a bull moose is castrated, he will shed his current set of antlers and grow new, deformed and misshapen antlers which will never be shed again. These antlers are often called "devil's antlers" and are the source of several Native American myths. In rare cases, cow moose may grow antlers due to a hormone imbalance. Because of their heavy bodies suspended by spindly legs, moose are especially dangerous when hit by passenger cars. If you are driving in an area where moose are plentiful, use caution and pay attention at all times. Moose antlers may weigh up to 70 pounds, and measure 6 feet across. Bulls will drop their antlers during the winter, and they will take around 5 months to grow back. One theory why moose lose their antlers is that it makes it easier for bulls to forage in the winter, when food is scarce. Moose are usually docile when it comes to humans; however during mating season hormones may cause the bull to become aggressive. Natural predators include wolves and bear, of whom mainly target the calves. 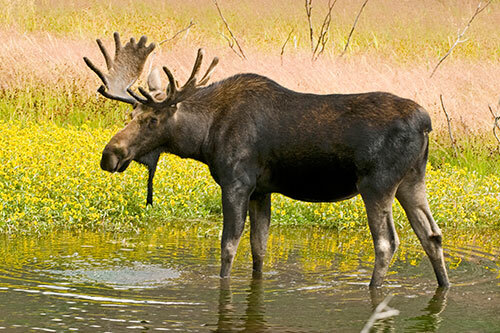 The nostrils of a moose are capable of closing when the head is immersed in water. This northern species exists in the boreal forest region across the Northern Hemisphere. Full of coniferous trees, the climate varies from -65 degrees Fahrenheit (winter months) to 86 degrees Fahrenheit (summer months). Moose do not have a problem spending their winter in the snowy region because they are adapted to it. Moose are herbivores, and eat many different types of plants, fruit, and bark. However, only eating plants and shrubs does not provide adequate amounts of sodium for the moose. Therefore, they eat a lot of aquatic foliage to add sodium in their diet. 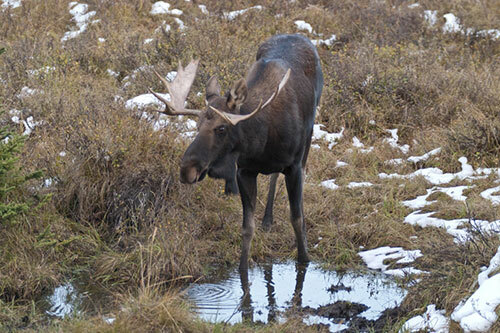 It is very common to see a moose wading in streams and marshes, with their head in the water, munching on vegetation. Because of their long legs, moose enjoy many high grasses and shrubs, and are able to wade through deep water when feeding. 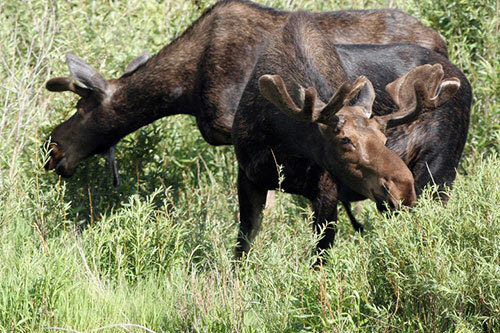 Feeding habits of moose will change with the seasons. In the spring, they tend to be attracted to meadows and fields where nourishment is plentiful. In the summer, moose can be found more in marshes and lakes, filling up on aquatic vegetation. During winter, moose will forage near the edge of forests eating bark and twigs as other vegetation will have dried up. Moose must consume 9770 calories per day to maintain their body weight. A moose will eat up to 70.5 pounds of food a day. Like many other big game animals, moose are most active at dawn and dusk. Because they have fewer natural predators, moose are not as keen to danger as many other members of the deer family. Their sense of sight is not as good as other deer family members, but they do still have strong senses of hearing and smell. Keep a look out for rubbed trees or moose dropping. Moose live in a small area, around 5 square miles. 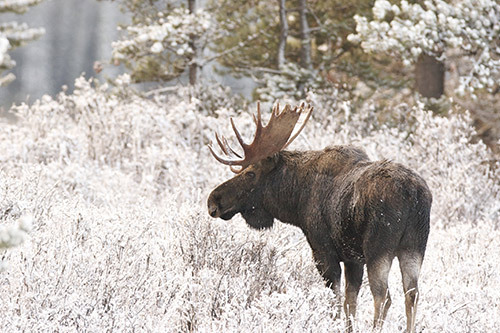 The easiest time to track moose is after a light snowfall. Always be cautious; a bull in rut has an unpredictable attitude, and a cow with calves is extremely protective. Never approach a moose, but rather watch from a safe distance. If a moose feels in danger, it will not tolerate the threat. It will charge the offender and stomp with its hooves. There are 4 basic calls, which are used by hunters or explorers mainly in the month of September to attract moose. Moose are hunted in the United States and Canada with both guns and bows. Moose are the most hunted “big game” animal in the state of Alaska. Each year, about 7,000 moose are harvested in Alaska alone. Moose hunting, like any other big game hunt, requires a hunting tag and license which gives permission to hunt this animal. Harvesting a moose illegally can result in a fine, suspension or loss of hunting equipment, or even jail time. Bull Moose lose their antlers every year and many outdoorsmen partake in the sport of finding them, called shed hunting. This activity is a great way to spend time with your hunting buddies or family. Shed hunting enables you to “take inventory” of the moose that have survived the fall hunt so you know what is still out there for next season. Shop for Moose gifts in our wildlife store. A moose’s long legs help it wade through deep water. 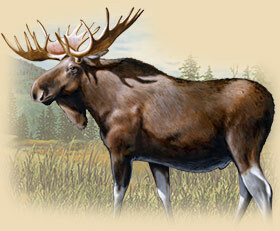 The moose in the above video is grunting because he is looking for a female, also called a “cow”. Moose need to eat more than 50 pounds per day in the spring, summer, and fall to support their body weight. 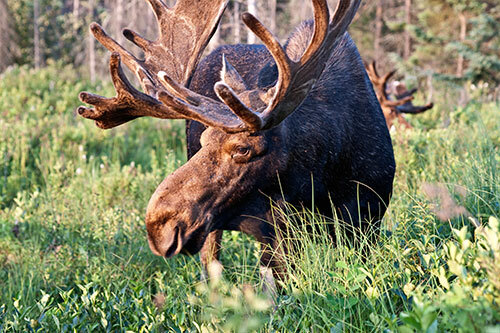 A moose stomach can hold more than 100 pounds of food at once. Moose are remarkably agile, capable of running at speeds of up to 35 miles per hour. Moose need to eat a lot of aquatic vegetation to provide sodium in their diet. 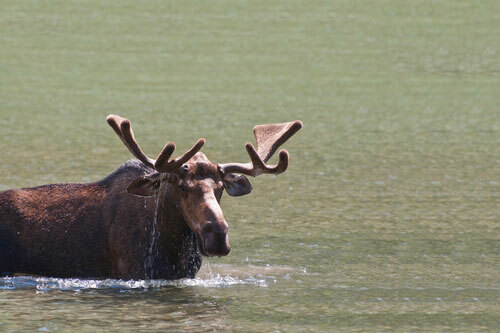 It is very common to see moose wading in streams and marshes. Calves can stay with their mother for about a year. Usually moose have one calf, but it is not uncommon for them to have twins. 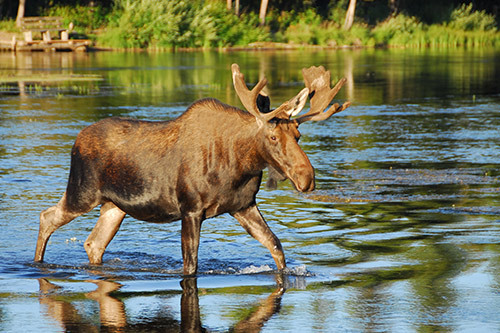 In the summer, moose will wade in streams to regulate temperature and seek relief from insects. In the summer, the antlers of a bull moose are covered with velvet. 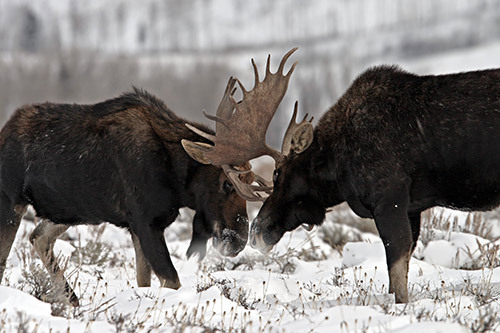 Moose bulls may fight for dominance by using their antlers to battle. In this photo, a moose pauses to look around a snowy landscape. Interested in Moose Gifts & Decor? 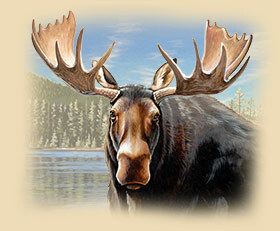 Visit the Moose section of our wildlife store!